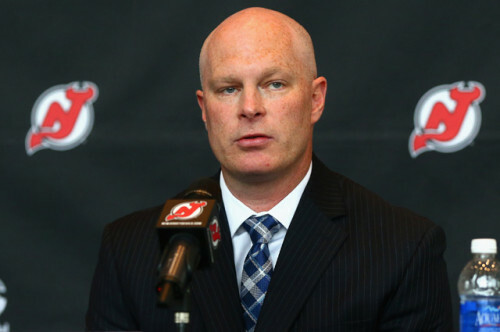 Yesterday, the New Jersey Devils held a press conference to introduce their new head coach, John Hynes. The conference comes just after Lou Lamoriello announced he would step down from GM duties, but remain president of the team. It also comes after former head coach Peter Deboer was hired as head coach of the San Jose Sharks. Hynes will take over for former Devils Scott Stevens and Adam Oates, who shared coaching duties last season. For the last six seasons, Hynes has been coaching with the Wilkes-Barre/Scranton organization (the Pittsburgh Penguins‘ farm team). He acted as head coach for the last five seasons. Before that, he was the head coach for USA Hockey’s National Team Development Program for six years, working with Erik Johnson, Colin Wilson, Patrick Kane and current Devils’ blue liner Jon Merrill. His new gig just made 40 year old Hynes, who hails from from Warwick, Rhode Island, the youngest head coach in the NHL. Interestingly, Hynes has never played in the big league, nor has he coached in it, but has developed a reputation as a rising star among coaches. Still, the Devils have hired a relatively unknown name among a huge free agent pool of experienced head coaches. Moreover, John Hynes was the only man Shero made an offer to. Shero also gave Hynes his first job in pro hockey, hiring him as Todd Reirden’s assistant coach for the Baby Pens in 2009/10. His hiring in New Jersey is a clear testament to Shero’s opinion of Hynes. John Hynes has become the fifth former head/assistant coach from Wilkes-Barre/Scranton to become a head coach in the NHL, joining a club with Dan Bylsma, Michel Therrien, Todd Richards and Mike Yeo. From that group, he holds the record for the most wins in the franchise (231), and was the AHL coach of the year in the 2010/11 season (his first year with the team). During the press conference, new GM Ray Shero highlighted three things that he wants to be associated with the Devils’ team: speed, attacking and supportive. He also said that he wants the Devils to keep up with the rest of the league, and to get faster as a collective – not just skating faster, but play an overall quicker game. He also said that the attacking part of the game works both offensively and defensively, putting pressure on opponents on both sides of the ice and with a more physical game. Finally, he mentioned that he wanted the team to be able to take care of the jobs assigned to players, make smart defensive plays, and remain committed to a 60-minute game. He also noted the importance of forwards supporting defensemen when getting the puck out of their own zone. Shero says he feels that Hynes understands the identity the team is working towards. With the new management team coming to fruition, the Devils are looking like a full overhaul is in the works, looking to make the playoffs next season.